In 2006, UCPGG established the Everyone In afterschool program. This program enables children with disabilities to attend traditional afterschool care programs by providing them with recreation assistants. UCPGG pays for the recreation assistant and the participating family is only responsible for the traditional charges of the afterschool program that they choose. Learn more about the Everyone In program. SNAP is UCP’s motor development program in the water for children with a variety of abilities and challenges. SNAP strives to help kids with special needs feel pride and self-confidence while helping them build stronger bodies, make friends, and have fun. 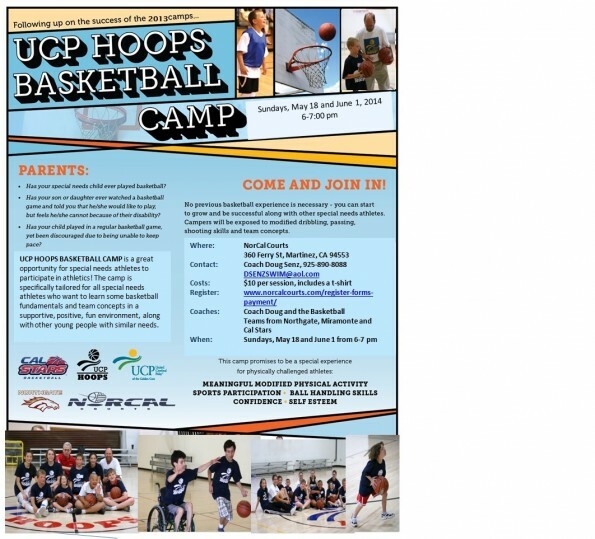 UCP Hoops Basketball Camp is a great opportunity for special needs youngsters, ages 6-18, to participate in athletics. This program teaches basketball fundamentals and team concepts in a supportive, positive, and fun environment. If a camp is scheduled, it will be listed on our events page. Read an article about our head coach, Doug Senz, from SportsStarsOnline.com, “When Dan Met Doug,” Part 1, Part 2.